What’s it like inside a hospital? And what happens if you have to stay overnight? This beautifully illustrated book introduces children to a busy hospital, from the operating theatre to the cafeteria, from X-rays to ambulances and from breakfast time to bed time. This is a wonderful way for children to learn about a hospital stay. In addition, the unique design of the book allows children to discover a “hidden” image by holding the page up to a bright light, much like a lift-the-flap mechanism. 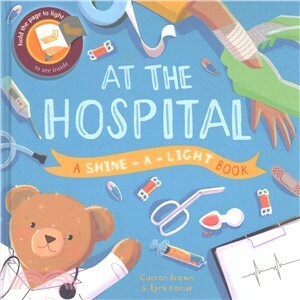 For children aged 3 and up, this is a wonderful introduction to hospitals.